Wheeeewwwweeyyy! It’s been quite a week! SO much is going on with both my family and Savannah’s family so we have been super busy causing a dry spell in our posting! 🙂 Sorry about that! But we’re back! Some of our projects in the works are uh-may-zing!!! Get excited! I know I am! Anywhoodle… my boys “playroom” is basically our living room so it only makes sense to have a toy chest in there. I found a box that I thought would work well but the style/colors weren’t working for me. Nothing a little fabric and paint can’t fix though ya’ll! The goodwill price tag sure beat the $79.99 price tag for the similar one I wanted from Target. The one from Target had little legs on the bottom and I kinda like that. I could add some little legs later if I finish the other kazillion projects I have going on. Please tell me I’m not the only one who’s in that boat?!? C’mon fess up! So.. whilst cleaning out the toy chest, I found this. Pretty sure those aren’t toys. lol. My apologies Hank, but this little lady needed help. I’m sure she was rockin in ’04! So here she is! Now she matches the rest of the room and can enjoy her playtime with my craaaazy boys! Whatcha think!? Do your kiddos have a playroom? Do the toys staaay in the playroom or do the all end up in the family room and kitchen like at my house?! Jamielyn @ I heart Naptime! She had her baby girl this morning! Head over there and congratulate her! So classy, I love it. We use trunks as toy boxes throughout our home. I think you did an awesome job! oh my goodness that is so amazing! i don’t have a play room so everything is piled in my living room in a corner. i need to find something like that. what a great overhaul. It is so cute! Yes, my boys have a playroom ~ happily for me, it is in the basement and toys aren’t allowed on the steps 🙂 Therefore, no toys upstairs, bliss! They have books in their rooms & art supplies in our craft room but toys stay *down*. I would never have know that you painted your toy chest, it looks like it was originally that color! Great makeover (and I love the swee tnote to the original seller). I have recently removed ALL toys from my living room except one small basket for the baby. NO. They do not stay out of the living room. At the end of each day, we have a toy hunt and put them all back in their rooms to go night-night. Sorta working-ish I guess. Ha ha. I love the makeover & LOVE the signage. Hilarious! This turned out great! At first glance I thought you’d stripped/scraped all that paint off yourself, and thought YIKES! But it sure turned out nicely! It’s amazing what a little fabric can do to make something look new again. I recently made over a toy chest for a friend, and turned a toy chest into a double-duty bench! Check it out if you get a chance! Love your blog! Wow! Great job!Love the fabric! Gorgeous! 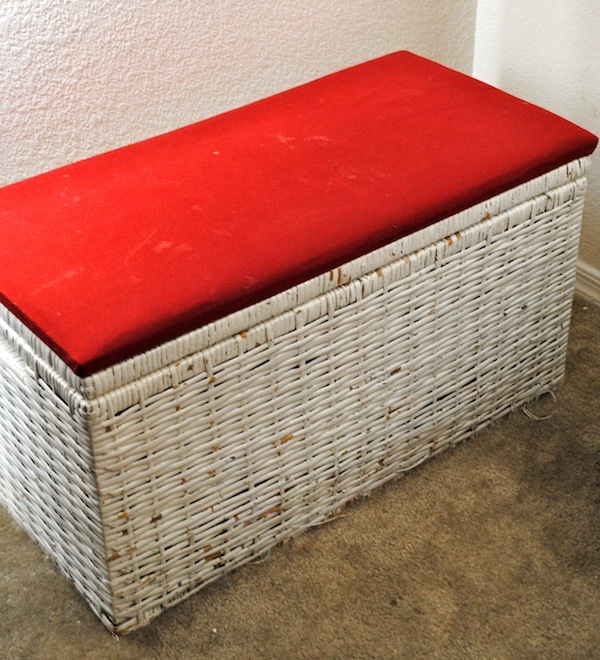 In fact, I did my wicker toy chest the same way earlier this year! My grandson comes over a few times a week. I started with one plastic tote for his toys. But they’ve multiplied like little bunnies, so I seriously need to do something. Love the wicker. 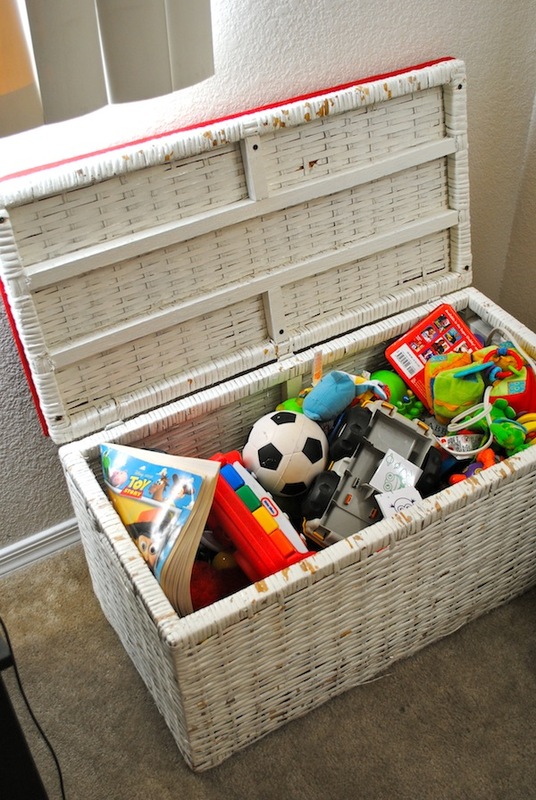 One of my clients has been looking for a wooden toy chest for a year – they’re outrageously expensive! – so I can paint Princess & the Frog on it. At this rate, her daughter will be grown by the time we find one!